Late last week one of my thesis advisees, Jiun Kwon, passed away suddenly and tragically. Her loss will be widely mourned — but her legacy lives on in the many lives she touched, and in the beautiful work she has produced and shared with the world. I never had the pleasure of having Jiun in one of my classes, but over the past two years — as we worked together on her smart and timely thesis — I came to know her as a vibrant, articulate, perceptive, diligent young woman; a gifted writer and media-maker; a lover of performance and comedy; and a widely known and highly regarded champion of social justice. Her myriad passions and talents converged in her thesis, which explores the evolution of stand-up comedy, and its function as a form of social critique, in an evolving media landscape — from minstrelsy through the age of YouTube clips, podcasts, and Twitter. I’ve posted below an excerpt from her introduction. Jiun submitted a brilliant final draft just as the fall semester began. It seems so unfair: barely a month has elapsed between this celebration-worthy achievement and her untimely demise. And while Jiun’s spectacular work was more than sufficient to fulfill the requirements of an MA thesis, she intended to keep working on the project — to keep adding case studies that explored the evolution of comedy and its potential as a tool for critical discourse about some of society’s most thorny issues. It was truly a gift to be able to work with Jiun. In a school as large as ours (we’ve got nearly 500 graduate students) I’m often baffled to see so many unfamiliar faces walk the stage at our end-of-year commencement ceremonies: how could I have encountered so few of these people during their two+ years in the program? I hadn’t known Jiun until she sought me out in late 2013. And I’m so grateful she did. Not only have I learned a great deal from her academic work — from her sharp mind and her commitment to critical social consciousness — but I’ve also been enriched and emboldened by the strength and clarity of her convictions, and touched by her kindness. Jiun designed her thesis on tumblr so she could display the work she was writing about; she embedded dozens of video and audio clips and still images. Because the thesis contains a significant amount of copyrighted material, she chose to keep the blog password-protected. When she submitted it, I knew it deserved a wider audience; it has so much to offer to scholars of media, comedy, social justice, and public intellectualism. So I asked her if I could share her work and publicize the password (comedy). She agreed. The resulting album, titled “Live” (as in, I live here) is ultimately a document of transgression. It is a space where the threat of literal death confronts the risk of performative abjection, a comedy performance that does not openly seek laughter, allowing tragedy to enter, and where silence nurtures connectedness. It features an audience who meets vulnerability, not with the threat of figurative death, but with a rallying support for life. It is an audience positioned in community, not in opposition. It is a singular work; material of a solitary occurrence that will never be reproduced anywhere else, yet replayed across an entire digital media landscape. Jiun would want her work to nurture such connectedness. Hers, too, is a singular work. And it deserves to be replayed across the media landscape, in celebration of her singular, exceptional life — and in pursuit of those ties that should connect us all, not only in tragedy and remembrance, but in shared strength and conviction. Rest in peace, Jiun. We’ll continue the work you started. …Previous studies of standup have primarily focused on live performance (Rutter, Timler), with standup media being examined merely as documents of live performance. But exhibition structures have shifted dramatically over time, and we are now deeply entrenched in what Lucas Hildabrand has dubbed a ‘culture of the clip’, due in large part to the move away from traditional television broadcast in favor of web-based exhibition, and the archiving of popular media in the age of YouTube. Older and contemporary works alike are disaggregated and remediated through an interconnected network that has accelerated our consumption through immediacy and access. These changes have cultivated a phenomenon of ‘non-narrative seriality’ that has reordered the relationship between live performance and the digital record, as well as between performers’ private and public personae. And in this current cultural moment, comedy is thriving. At the time of this writing, the landscape of comedy is notably vast, stretching across various platforms (television, radio, web, podcasts, live performance). 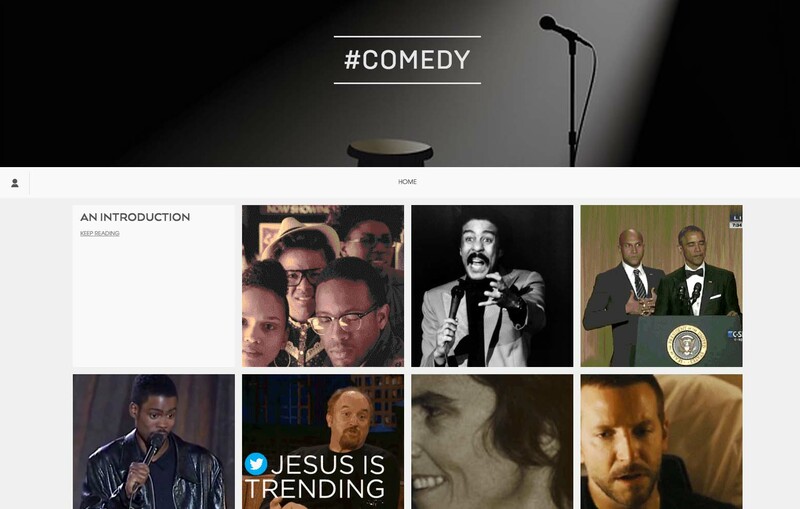 Comedians are active across various social media platforms (Facebook, Twitter, Instagram), with audiences interacting directly with them through these tools. People share clips through these platforms as well, creating a climate where exhibition, consumption, and critique are all occurring simultaneously in a shared virtual space. Essentially, the comedy audience is the media audience. Who is creating for whom? This should be a central question of any cultural dissection of comedy. This is not to say that we are required to hypothesize about a comedian’s motives and intentions when crafting a joke. But we must be aware of who is speaking, who is listening, and how the work is being delivered (time, place, and format). Through cumulative analysis, we discover that the media of standup comedy and its relationship with this new media audience, far exceeds the reach of a single piece of joke work or comedic performance, and has cultivated an enhanced form of engagement from its audience that transcends the expectations set in a live comedy space. This section takes a look at some of the current discourse on the media of comedy, which includes commentary on political correctness, free speech, race and gender. One of the biggest challenges in comedy is how to talk about race. In order to address some of the larger questions of representation, we must examine and contextualized the role of media and entertainment in race comedy and its social impact. And so this first of three sections on race, focuses on comedian Richard Pryor, his comedic narrative in the context of his own personal history, and the role of the media documentation of his work. The following section draws on three separate clips that spotlight the anxiety of anger as expressed through black comedians and distilled through the white media. The fourth case study attempts to unpack the complexity of one of Chris Rock’s most famous and controversial pieces from his first comedy special, and the inherent conflict of creating visible race comedy. THE VIRALITY OF LOUIS C.K. The following chapter focuses on Louis C.K. I discuss his role in the canon of standup, and his position as a bridge between generations, through his embrace of new forms of exhibition. And finally the last* chapter on Tig Notaro’s performance at Largo in 2012, through which she publicly declared that she had been diagnosed with cancer, is a deconstruction of performance through its mediatization, both as an audio document, and viral subject. * The scope of this project currently does not lend itself to a comprehensive history of standup comedy or in-depth inclusion of race/feminist theory, but it is my intention to continue to grow this space to include many more case studies to inspire further critical analysis on the intersectional study of comedy and media.